A series of prototypes for contemporary water clocks, by artist Andreas Kindler von Knobloch, commissioned by the Department of Ultimology. 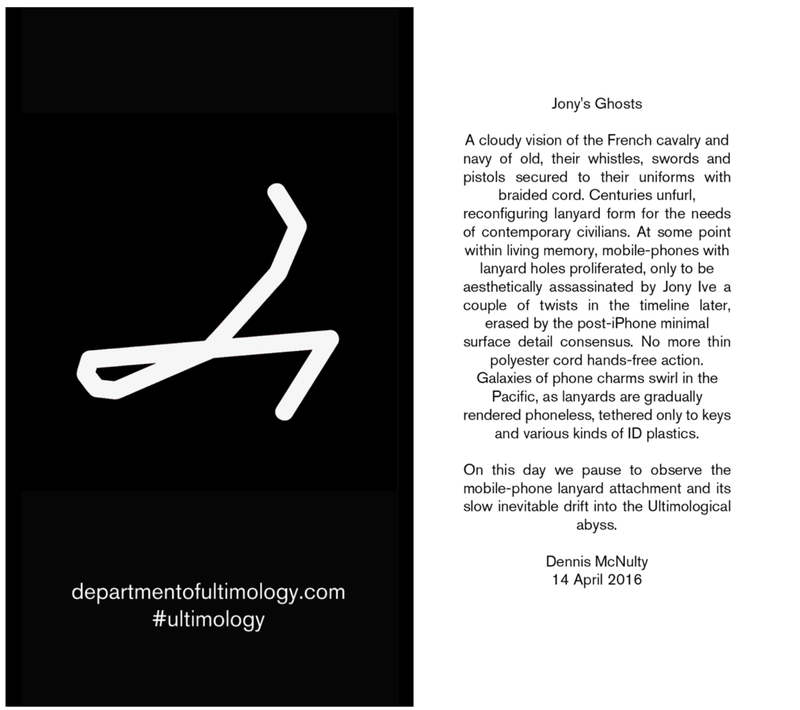 These works evolved out of an ongoing dialogue between the artist, the Department of Ultimology and CONNECT, regarding discarding obsolete ideas and areas of practice as part of an ongoing series of 'Research Purges'. 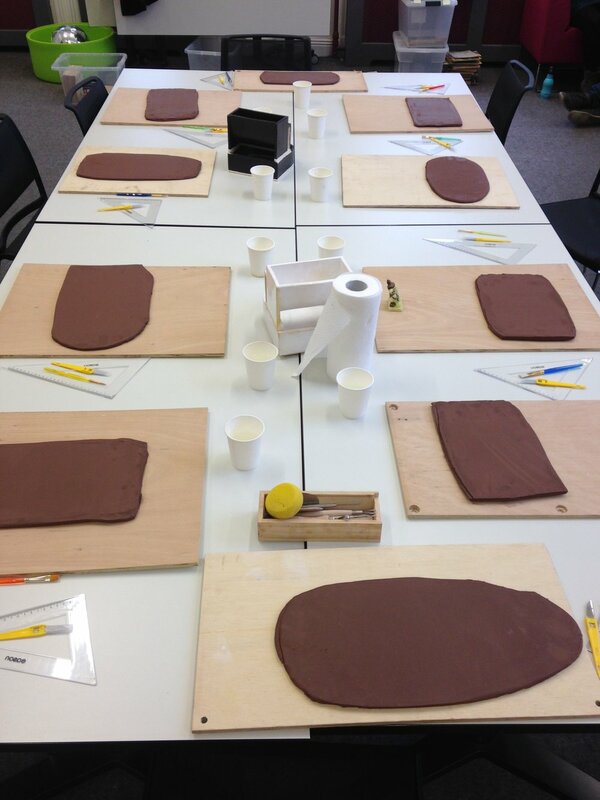 The sculptural pieces are handmade using a technique the artist describes as 'slab clay making'. Each piece comprises uniquely shaped segments, which when placed together create a functional object for the measuring of time, operated by the insertion of a smartphone into a cavity. Based on the earliest forms of time-keeping that are not based on celestial objects, these water clocks suggest a reclaiming of time through the surrender of our devices. In conjunction with the creation of these pieces, Andreas delivered a talk and workshop at CONNECT for the engineers and researchers there, reflecting on both the concept and construction of the work. A newly commissioned live score by Sean Carpio provided a soundscape for an Ultimological worksheet. 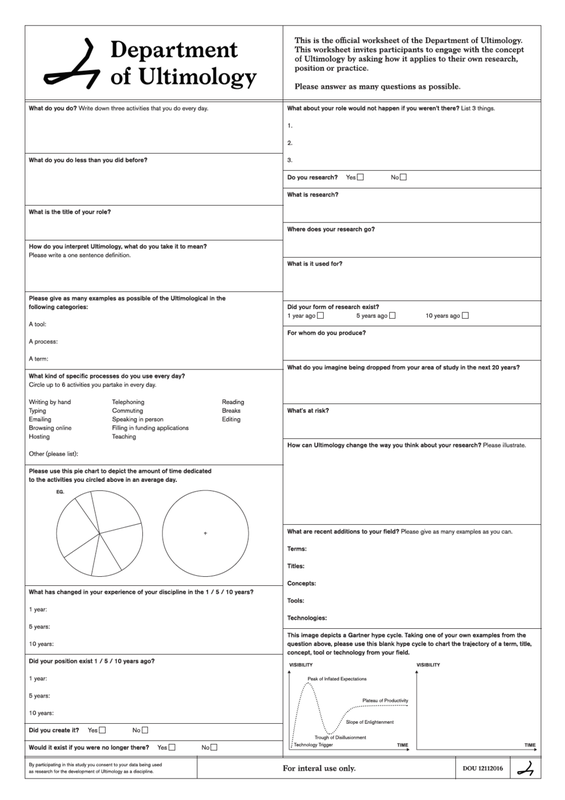 The score set the rhythm and pace for the filling in of the questionnaire, which was devised by the Department of Ultimology and designed by Alex Synge/The First 47. Questions were read aloud by Master of Ceremonies Barry Fitzgerald, and bells were rung to notate duration and mark time on each answer. The performance took place as part of an event hosted by the Metafizz philosophical society of Trinity College Dublin. Dennis McNulty's commissioned lanyards for the First International Conference of Ultimology represent the potential of the infrastructure of administration as a site for artistic presentation and experience. The lanyards created by McNulty became the medium for a poetic text and lost technologies (extract above), and the objects themselves symbolise defunct corporate merchandising (defunct because of their now useless Nokia 3310 phone attachment cord). Working in this way allows unsuspecting audience members to experience artworks by stealth, in a unique and unexpected context. The curatorial mediation of the work is vital to its recognition (and subsequent impact as a container for meaning) as an artwork. Attendees were encouraged to keep their lanyards (each of which were also personalised with their names) as a memento of the event, and as the residual material component of an artwork. As part of the First International Conference of Ultimology, Fiona Hallinan responded with the Illusion of Infinite Resources. 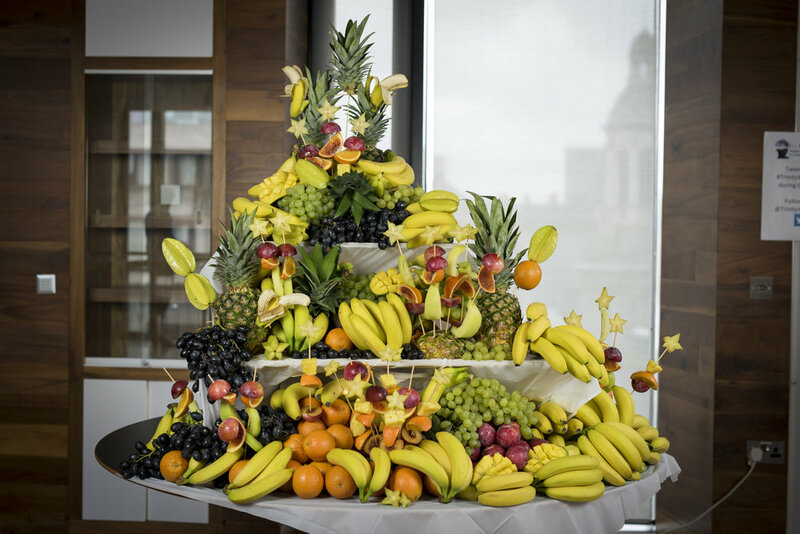 Its title references a term used in programming for services that provide a false sense of infinite provision, and its form comprised a faﾍade of excessive, arranged fruit with a false backing of cardboard boxes and wood. This work acted as a source of nutrition and hospitality for the conference, both providing food for attendees and a conduit for meaningful exchange and conversation.